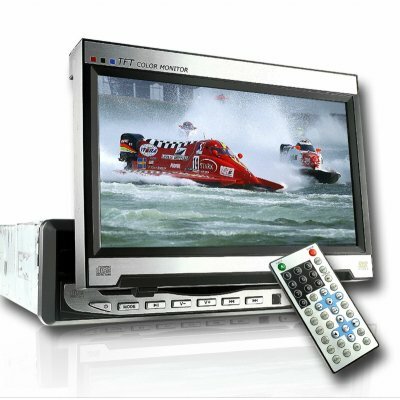 Successfully Added 7-Inch in-dash TFT LCD Monitor (16:9) with DVD Player to your Shopping Cart. Our classic 1-DIN Car DVD Player with TV Tuner and manual retracting 7-inch wide screen. This model is famous for its absolutely beautiful rendition of your DVD's in 16:9 aspect ratio. It can play DVD's, CD's, MP3 CD's, as well as cd-r and dvd-r disc playback. The screen on this unit also will tilt left or right for optimal viewing angle for either you or your passenger, and the wholesale large screen car DVD player comes with an analog TV tuner with TV aerial included for even more in-car entertainment choices. All products on Chinavasion.com come with our famous 12-month warranty and an array of shipping and payment options for maximum convenience. See why this is a long-time customer favorite, click "add to cart" to order yours today. lo unico que el caple azul positivo hay que conectarlo con el amarillo negativo sino no enciende. Muy rapida su entrega y gracias de nuevo por buestro servicio. on 2009-02-09 21:04:42 Very Good! on 2006-06-01 10:18:42 Tv will work in brazil with pal-m mode??? I want now about the tv mode, because in brazil, the mode is pal-m!!! This tv/dvd will work? ?